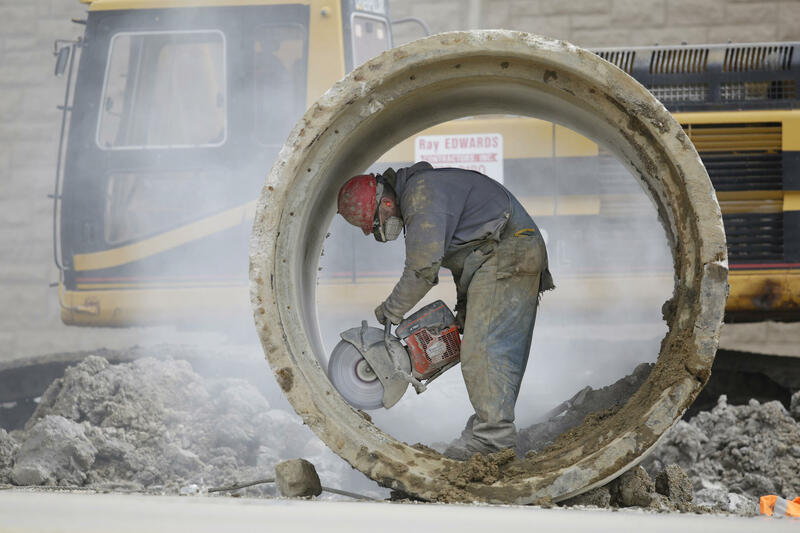 Construction worker Shawn Ferrin of Midlothian cuts concrete storm sewer pipe along the eastbound lanes of the Elgin-O’Hare Expressway in Roselle on Tuesday, April 15, 2014. These expansions are part of the Elgin-O’Hare Western Access Project. The project will be completed in 2018. Construction begins in earnest this year on a multibillion-dollar stretch of highway in DuPage County amid a growing sense that its potential to become a long-promised western route to O’Hare International Airport will fall far short of expectations. Political and business leaders have envisioned a roadway, lined with retailers and other services, that takes passengers to a new western terminal at O’Hare. But plans for the terminal never got off the ground, and on paper, the road system set to be built by 2025 will be a bypass that will still force air travelers who live west of the airport to circle around to the old eastern entrance. The situation stems from a decade-old deal involving DuPage County, suburban mayors and the city of Chicago. The county and municipalities agreed to accept new runways and the noise that comes with them, and the city would persuade O’Hare’s biggest airlines to kick in millions of dollars to help build a western terminal that would make a future highway practical. But while new runways are being built and so is the highway, the airlines are not on board with a new terminal, which might bring in competitors. And without the terminal, the highway appears to be, in effect, a road to nowhere. It will dead-end at the airport’s western boundary, several miles from the nearest terminal. Those wanting to proceed to the airport will take another new road north or south to get to the old entrance. Or they might one day be able to use a park-and-ride system, featuring 35 to 40 minutes on a shuttle bus. As if that wasn’t frustrating enough for western suburbanites, the new roadways will carry a toll that’s more than three times higher than other area toll roads. State lawmakers last June approved the long-planned $3.4 billion Elgin-O’Hare Western Access project. It will include an extended Elgin-O’Hare Expressway that intersects with a new north-south tollway skirting O’Hare’s western edge and connecting to the Jane Addams Memorial Tollway (Interstate 90) and the Tri-State Tollway (I-294). Even though the Tollway is spending $3.1 billion on the project, there is a $300 million funding gap, which DuPage County and local communities will have to provide. The county has secured about $110 million in funding so far, DuPage County Board Chairman Dan Cronin said. Proponents of the project see underused land stretching east from the western suburbs being transformed into gas stations, restaurants, hotels and shopping centers employing tens of thousands of people. They point to predictions from an advisory council appointed by Gov. Pat Quinn that say the project will create 13,450 jobs during construction and that future development will lead to 65,000 new jobs by 2040. “There are 127 square miles of untapped opportunity out there that brokers and developers are excited about,” said Greg Bedalov, president and CEO of Choose DuPage, which markets DuPage County and supports economic development. “Absent a western access road and absent the needed infrastructure, that day will never come,” he said. “Some people say to me, ‘Greg, come on, you are building a road to nowhere.’ But I disagree. 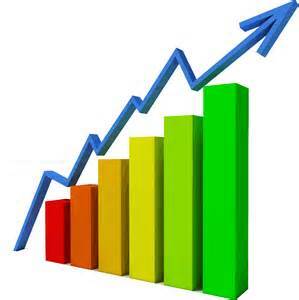 Transportation infrastructure is in the team photo of the first three things that developerslook at,” Bedalov said. Cronin said he supports the idea of western access to a new terminal, but said that day won’t come until an improving economy generates hundreds of additional daily flights at O’Hare, and added that he’s taking heat from constituents in the meantime. “There are a lot of people, particularly in my neighborhood, who are like, ‘Cronin, what are we signing onto this thing for? Why do you support the toll increase? We don’t even have a commitment that they are going to open up (the road into the airport),’ ” he said. Cronin said he shares the frustration, but he insists the commitment will be made. “We might be gray, but it will happen,” he predicted. But for now, the closest thing to true “western access” to O’Hare, when all is said and done with the project, will be a $17 million, fishhook-shaped ramp off York Road, which will dead-end on O’Hare property. The Tollway agreed to pay for the ramp even though it was not directly connected to the new tollways because it was favored by DuPage County and the local communities, Tollway spokesman Dan Rozek said. “The Tollway frequently works with local communities to make improvements on existing, adjacent roadways while building or improving interchanges to improve traffic flow,” Rozek said. The city-suburban deal a decade ago that was to help make a new terminal possible rested on the idea that the former administration of Mayor Richard M. Daley could persuade the biggest commercial carriers at O’Hare, United Airlines and American Airlines, to investmillions annually to pay for their share of the new western terminal campus. It would house more than 50 airplane gates and provide parking facilities for passengers on empty land along the west side of the airport. But the airlines, which have welcomed new runways to ease flight delays and increase O’Hare capacity, never bought into the city’s plan for terminal expansion, which likely would entice other airlines to compete against the two mega-carriers. Executives at Chicago-based United and at American have consistently said that two new runways that opened in 2008 and 2013 plus a runway scheduled to debut next year, along with other airfield improvements, are adequate to meet the two carriers’ needs for the foreseeable future. The airline officials said any future investments will be based strictly on demand and cost efficiencies, not the city’s desire to complete the airfield expansion project, which under the most recent projection released by Chicago aviation officials is estimated to cost $9.7 billion in 2012 dollars. And the park-and-ride idea, which in the O’Hare expansion master plan has pointed to a possible extension of either the airport’s people mover transit system or the CTA Blue Line, has been scaled back to a shuttle bus that’s 35 to 40 minutes from the main O’Hare terminals. For their part, Chicago officials said they are moving to complete O’Hare expansion. The aviation department conducted a study in 2010 that developed several alternatives for the western terminal to possibly serve domestic and international flights as well as provide passenger connections to the main terminal core. The main purpose of the study was to “ensure that developments on the west side of O’Hare, including the proposed Elgin-O’Hare west bypass, can co-exist,” Pride said. Quinn’s executive director at the Tollway, Kristi Lafleur, acknowledged there is no assurance of any development on O’Hare’s western edge, but she says the $3.4 billion project around O’Hare represents “an interim step” that would facilitate any future airport expansion. “We’re not sure Chicago or the Department of Aviation is committed to a western terminal,” Lafleur said. He speculated that a likely scenario would be for Chicago to use some of the vacant airport land to build hotels and restaurants and maybe even an entertainment complex — the same type of projects that officials in DuPage are pushing on the land outside the airport. “That would be bad for us because it takes away potential business from our communities,” Johnson said. Andolino did not respond to interview requests by the Tribune. Tolls along the Illinois Tollway will cover the lion’s share of the $3.4 billion project, which was part of the reason toll costs systemwide nearly doubled in 2012. But estimates suggest motorists who use the new roads will pay a premium, roughly 20 cents per mile for passenger cars versus the current 6-cents-a-mile average. That’s the price motorists face for still having to circle the airport and enter from the east, via I-190, and onto the chronically traffic-clogged circular roadway that sits in front of the three domestic airline terminals.